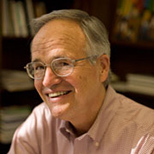 James Gustave "Gus" Speth is a professor of law at the Vermont Law School in South Royalton, Vermont, and senior fellow with Demos, The Democracy Collaborative, and the Tellus Institute. He was professor in the Practice of Environmental Policy at Yale where he served as dean of the Yale School of Forestry and Environmental Studies from 1999 to 2009. From 1993 to 1999, Speth was administrator of the United Nations Development Programme and chair of the UN Development Group. Prior to his service at the UN, he was founder and president of the World Resources Institute; professor of law at Georgetown University; chairman of the U.S. Council on Environmental Quality; and senior attorney and co-founder, Natural Resources Defense Council. Throughout his career, he has provided leadership and entrepreneurial initiatives to many task forces and committees whose roles have been to combat environmental degradation, including the President’s Task Force on Global Resources and Environment; the Western Hemisphere Dialogue on Environment and Development; and the National Commission on the Environment.